MacDailyNews Take: The photos we’ve seen are of units that are warped noticeably more than four sheets of paper. If your iPad Pro is warped over 400 microns in variance, take/send it back to Apple and ask for a replacement. Apple has a warped sense of quality. Or maybe, just maybe the media has a warped sense of reality ..
See my below post .. I call BS. The one in the photo looks bent. or has had pressure put on one side. Ive bought 2 and both are perfect. First: Riccio can brag all he wants about drawing dimensions for the static parts, the fact is that iPads must be designed for some level of abuse including bending. With Jony constantly demanding thinner devices, the newest Apple products have definite structural compromises. Second, we have a glass screen with a metal bezel. A well designed multi-material assembly will at least attempt to ensure that the metal cannot plastically deform before the glass shatters. If you see broken glass, you will know an accident or abuse occurred. If you see bent metal and perfect glass, then we have a design and / or manufacturing problem. That problem doesn’t have to do with how flat Riccio’s minions can stamp the metal. It has to do with how much margin the metal has before it reaches its plastic limit. ‘Some level of abuse”. Of course!…but as a high end computing device.. not a snowboard or alike. ‘Some level of Abuse’ is a very vague and subjective statement. Mine is doing just fine.. 1.5 months.. used for 4-6 hours a day ..and im not an obsessive compulsive caretaker of things. Obviously not controlled very well. Apple, you’re not doing yourself any favors trying to justify that this is acceptable ! What you claim is “obvious” is not backed by any data as far as I can tell. You have the word of Apple regarding their manufacturing tolerances with respect to chassis flatness. I trust that word. Then, you have pictures of bent iPads with no solid evidence of how they arrived in that state. I see claims that they came that way out of the box, but I have no reason to believe those claims. Furthermore, given my experience with fabrication of advanced techology products, I cannot conceive how such a device could successfully pass through quality control prior to packaging and shipping. I suppose that someone in the manufacturing facility could have intentionally sabotaged Apple. Another possibility is that people damaged the “affected” iPads, intentionally or unintentionally, very soon after they were purchased. In these situations, I always ask who has the most to gain and how is the information being used. It is very possible that this is a coordinated smear campaign against Apple calculated to amplify the current stock price retreat for the benefit of an individual or small group of investors. You don’t have to be a chicken to know when an egg is rotten. It’s plain common sense, something that constantly eludes you. I don’t care how many Apple Fanboy Apologists like you and Jimbo, etc. drill down in the weeds with semantics and creative excuses. Changes NOTHING. Consider this…Apple has been manufacturing and shipping iOS products since the original iPhone in 2007. Apple has shipped hundreds of millions of devices over the years, and I have never heard of one that was warped out of the box until now. So, what is the most likely explanation? That Apple suddenly abandoned its legendary attention to quality and detail in its products? Or that someone is attempting to make Apple look bad for either personal gain or a personal vendetta? Until the evidence is collected and assessed, I will give the benefit of the doubt to Apple in this case. Logic guides me to that course of action. If it turns out that some defective iPads slipped by, then Apple will replace them and address the flaws in the manufacturing and inspection process. Time will tell. Emotional reactions will not change the outcome. You can’t tell the straightness of something when the photo is taken from a phone – There will always be lens distortion unless you are using a professional camera setup with a lens that makes it straight.. If they are warped beyond tolerance then I am sure Apple would replace. While I cannot claim that the curve is due entirely to lens distortion, you can clearly discern the effect of the wide angle lens in the corners of the box and the parallax of the lines. Furthermore, the far right corner of the box (same side as the apparent curvature of the iPad) is far more distorted than the left. The red lines added by MDN are worthless. Anyone with a bit of knowledge and intelligence would know better than to pull that kind of stunt. People are way too gullible these days. If someone were honestly trying to show the curvature of the iPad, then why choose such an odd perspective and set up? It doesn’t make sense to me. If Apple is shipping defective iPads, then I expect the company to replace the defective units and sort out its quality control issues in China. If this is just another hoax to disparage Apple, then I would appreciate some investigative reporting. I am extremely tired of the misinformation and fraud. If Apple claims that the bend in the ipad depicted in the pic is ok.. then they are full of Crap ! 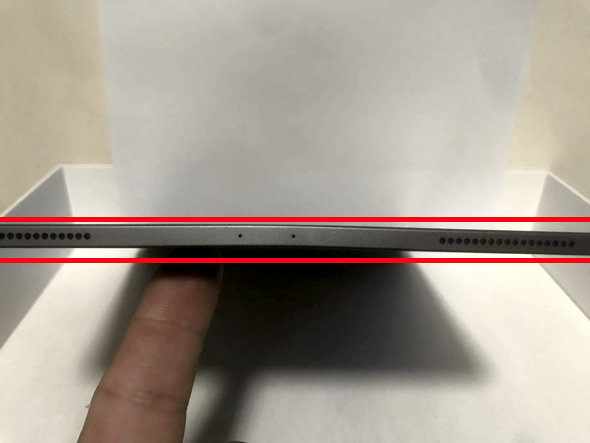 But I dont believe Apples/Dans comments is refering to the bend in the Ipad depicted in the picture. That ipad has been carried around in a backpack for a week and and there is no saying if it was abused and mistreated. . I wouldnt just throw an 2k ipad computer in my backpack and run around.. that’s careless …. and any damage from that is owners responsibility. I believe Apple is addressing the issue Dan specifily and clearly pointed out: slight bend, thickness of few sheets of paper. That i can see as acceptable…. Previouse ipads had curved edges.. so it would have been harder to detect minute, insignificant bends. But with the New squared off edges its easer to destect the slightest bend if layed on flat surface. So ya.. i think Apple may be correct .. but they are full of Bull-crap if they claim the above bend depicted in the picture is ok !. Ps..I have had my new 12.9 pro for about a month and half now. It spends most of its time on my uneven laps.. then tissed on the sofa cushions or placed on side tables.. etc……and it is not in a case.. just a protective film on the back. Never saw anything that grabbed my attention. The bend in that image looks a WHOLE LOT MORE THAN 4 SHEETS OF PAPER. Apple trying to justify a clear prxuct manufacturing complications/ problem/side effect/defect is just a joke! Sad that a company of the likes and finances, as Apple attempt to push a sub-par manufactured, expensive high end product on potential customers and tell them that such a slightly bent product is a perfectly fine and acceptable to purchase. Especially at the high pricing Apple is charging for such a premium and seriously expensive electronic device. No one else will, either. You are jumping to conclusions way too fast. There isnt enough data to draw conclusions from. The ipad depicted above was not straight out of the box.. it was tossed and carreid around in a backpack for a week.. So lets wait for more data.. before we bash. MichelPM, your post exhibits a ridiculous and emotional knee jerk reaction based on no real evidence. The comment from Apple regarding iPad flatness tolerances was a generic statement. It was not made in reference to that suspiciously lousy photo. Furthermore, you have no way of knowing how that iPad became bent (assuming of course, that the bend is real and not exaggerated by the photographic technique). Chill out and let the story develop before you release your outrage. It may be completely unnecessary. There you go AGAIN — trying to confuse people with logic and reasonableness! I call BS on the bent pics. No way. My new iPad Pro 12.9 is flawless. If that iPad is bent that bad someone did it. Not out of the box bent like that. Get real. If that’s what passes muster for exceeds manufacturing expectations at Apple then I don’t think I will be able to buy another product from them ever again. This is absolutely outrageous. Bent tech for over £1000 being considered acceptable. Outrageous. There is no reason to believe that. No reason at all. See above. Then calm your outrage and relax. You are too easy to spin up. That makes you a tool, Tim, for anyone who needs to generate emotional reactions for their own benefit. It’s an appropriately emotional response to the quote from Dan Riccio. I am angry about how Apple have chosen to respond to the criticism. The way a company should respond to criticism which says their new expensive toys are shipping bent is to reply that any bent iPads are a mistake and should be replaced. It is not to say that it is within normal limits. He has opened the gates to a series of articles which will carry that photo of a visibly bent iPad along with his quote saying that it’s ‘normal’ and ‘expected’. That makes Apple look ridiculous. that the photo isn’t real? This is not a photo of a brand new iPad with a bend. It is a photo of an iPad somebody bent. It is a fake story designed to manipulate people. What would you like Apple to do? Lie about their manufacturing tolerances? 400 microns is acceptable and you would never notice it. Somebody took Apple’s honest response and paired it with this faked photo of a bent iPad. Faked meaning it’s not a brand new iPad off the manufacturing line but instead an iPad somebody bent. It’s an unfortunate situation but this is the world we live in where trolls take as many cheap shots at Apple as they can. Yes … I do understand it’s not real. And for those apologising. Apples only response to this should be: if you receive a bent iPad then this was a mistake and we will replace your product immediately. NOT this is within normal specifications BS. Tim, if these complaints are legitimate, then Apple will make it right. Until then, secure your outrage. You appear foolish. The people who are upvoting your comments are foolish, as well. Are they not also tools?